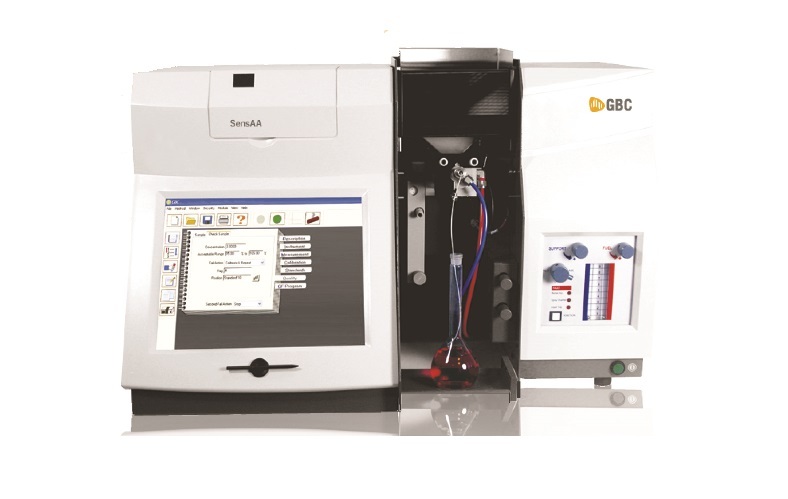 GBC Scientific Equipment introduces the latest Atomic Absorption Spectrometer, the SensAA. The SensAA is new in every aspect from the ground up – from its performance to its looks and functionality. It may be our low cost AAS but its performace exceeds many top of the range products in the marketplace. The SensAA series sets new pre-requisites wth the new Hyper-Pulse Background Correction that allows for more accurate interpolation of “Transient Signals” such as GF signals. The new GCM (gas control module) is fully interlocked with the new fully integrated Spray chamber/liquid trap for added safety. The SensAA is supplied with an inbuilt P4 computer and touch screen technology. A large 15″ colour screen allows clarity of use and also ease of inputting data and executing commands to the SensAA software. No more keyboards or mouse wires to get tangled with acidic sample solutions. Point and analyze! An inbuilt software keyboard is also available where text is required to be entered by using standard Windows® XP as the operating system then any Windows® software package can also be loaded into the SensAA further extending its fuctionality. As always GBC AAS accessories are interchangeable and can be used on the SensAA. For further information, please contact GBC Head Office or your local GBC office.